My good friend Tracy’s daughter Rachael is getting married January 3rd. The colors are chocolate brown and red. I have been given creative freedom; because of that my mind is running away with me. I love having all of these ideas just flow right out of me. I am convinced that I can take the grapevine ball above and insert it in to the middle of all red roses and carnations and come up with a stunning design. 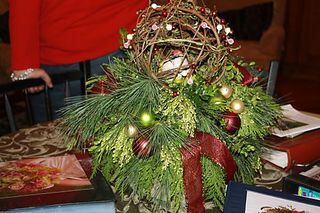 In the above picture we added holiday decor and birds in the center of the ball. For Rae I will use the ball natural brown and in the center will be a cluster of red roses. The whole base of the ball will be a rich full cluster of all red flowers. I can not wait to make these pieces.